The European Union has 28 member countries. And kinda like Captain Planet, when their powers combine, they make for a pretty great place to live. But that doesn't mean each country is without its flaws. It's like the Planeteer who controlled the element of Heart. Sure, he helped make Captain Planet. But he was the worst at getting haircuts. 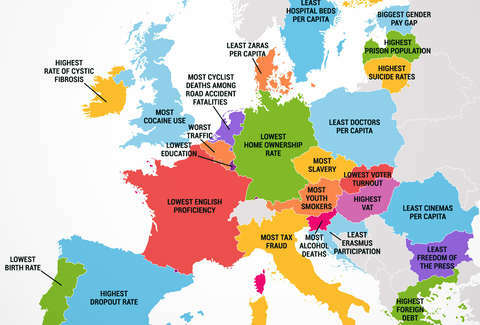 Anyway, here's what every European country is the worst at. For whatever reason, young Austrian people seem to think smoking is still cool, so they're sucking down cigarettes. A LOT of cigarettes. Every day, 29.4% of Austrians age 15-24 inhale coffin nails. In the time it takes to drive through a Belgian city, you could probably eat a dozen waffles. In fact, the two most traffic-congested cities in the world, Brussels and Antwerp, are both in Belgium. You thought Houston and Atlanta were bad -- now try navigating all that in Dutch and French. According to Reporters without Borders, Bulgaria has the least freedom of the press in the European Union, and it ranked 87th on a list of 179 countries in the world. We'd badmouth Bulgaria more, but nobody there is probably reading this anyway. The country with the most freedom of the press in the world? Finland, of course. Since 2000, Croatia has had the least participation in the Erasmus, Europe’s university exchange program, compared to its total population. 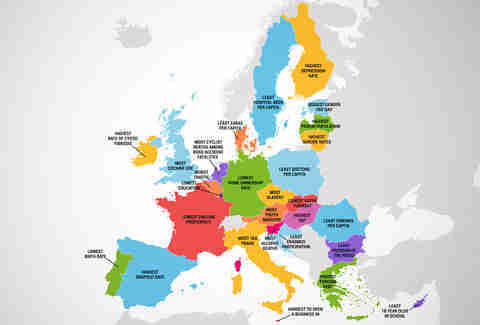 The country is the most recent addition to the European Union, having officially joined in July 2013. It’s also really easy to spot on a map because it’s shaped like the first letter in it’s name (a big C), which is way cooler than the Italian boot shape. Italy should be named Bootaly. That'd be way better. What are 18 year olds in Cyprus doing? Well, not smoking as many cigarettes as their Austrian peers, or being killed by cars while cycling like the Dutch. But they're definitely not going to school as much, either. But if you were surrounded by that Mediterranean climate, you probably wouldn't want to be in school, either. The movie Taken should have taken place in the Czech Republic, end of story. Life in Denmark is pretty great. But there are only two Zara stores in the entire country. God forbid you'd have to shop somewhere else. But really, if you're after reasonably priced Spanish clothes, you’re going to have to fight for them against other Danes -- in fact, you'll have to fight with about 2.8 million other Danes per store. That's a lot of Danes. In Estonia, women make 27.3% less than their male counterparts. Even in a place thought of as being really macho, like Italy, the difference is only 5.8%. Women’s wages in Estonia are more unfair than the rules of Monopoly. Finland is really good at a lot of things--like that "whole freedom of the press" deal. But depression is pretty prevalent; if you were that far north, you'd probably get depressed by all the cold weather, too. 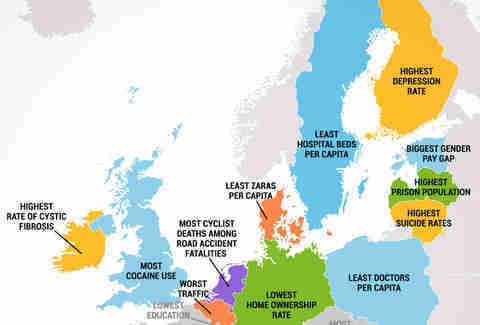 Fortunately, Finland's suicide rate is no where near Lithuania’s. To no one’s surprise, France has Europe’s lowest English proficiency. Somewhere, a guy eating soft cheese and a baguette is saying, "I don't care" in French. Germans aren't particularly interested in owning their own homes... probably because they already own most of Spain and Greece. This one just edged out "Country with hairiest arms". As of the end of 2013, Greece’s foreign debt was 130.3% of its GDP. Translation: that's really bad. Hungary has the highest value added tax, with the standard rate a whopping 27%. So if you’re Hungary (get it?) for the government to take a high percentage of the money you spend on consumer goods, this should be your new home. Ireland has the highest rate of cystic fibrosis, at a rate of 1 case per 1,800 births. You can't really joke about something like that. Is it any coincidence that Al Capone was finally pinched for tax evasion, while the birthplace of the mob has the highest percentage of unreported economic activity of any European Union country? Probably not; the mob and tax evasion go hand in hand. It’s estimated that $239 billion USD are lost in unpaid Italian taxes per year. That's billion, with a B. Think of how many spicy meatballs that could buy. Latvia has the highest percentage of its population in prison, with 305 per 100,000 inhabitants locked up. And yet, despite that mind-boggling figure, it’s only half of the rate in the United States, which sits at 716 per 100,000. Lithuania’s suicide rate is so high, it’s nearly ten times higher than Greece’s. WTF is going on in Lithuania? In 2007 Luxembourg spent only 3.15% of its GDP to fund public education. Presumably, the rest of its GDP was spent adding more vowels to the country’s name. On a list of 189 countries compiled by the World Bank, Malta ranked no. 161 on ease of starting a business. It even outranked other countries notorious for disorganization like China, the West Bank, and Spain. Two words, Malta: banana stand. It’s really hard to find anything wrong with the Netherlands. Well, except Arjen Robben. Despite the stereotypes, though, the Dutch are far from the highest consumers of marijuana (that would be Denmark). But on the off chance you get into a car accident in any EU country, the odds of killing a cyclist are highest in the Netherlands. You have a lower chance of bumping into a doctor in Poland than of being able to pronounce his name correctly. Romania has only 3.8 cinemas per million inhabitants. Can you imagine what that looked like on the day Guardians of the Galaxy came out? Lines must have been hundreds of thousands of people deep, and still nobody wanted to sit in the front row. On the other end of the spectrum, the Czech Republic has the most cinemas per capita, with 49.2 cinemas per million inhabitants, presumably because they are being built and operated on slave labor. Who votes in Slovakia? Almost nobody. Actually, it's 13.05% of the population, but that's a pathetically low turnout. Voter turnout was the highest in Belgium, with 89.64% of the population showing up to vote. Those people should vote to have less traffic. Slovenia, you really need to learn about moderation. 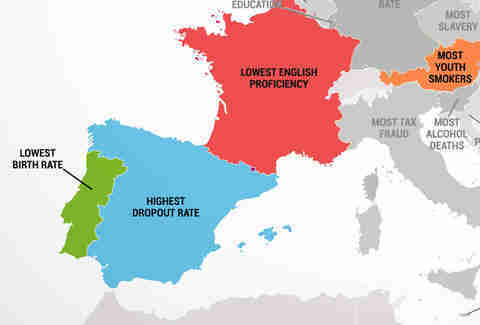 For any Spaniard reading this, a dropout rate is the percentage of students who do not complete schooling. In Spain’s case, 23.5% of students in the country do not complete mandatory education. So basically, 23.5% of Spaniards looking at this article have no idea we're talking about them right now. Maybe Sweden has fewer sick people than other countries. Or maybe Swedish hospitals prefer patients bring their own sleeping bags. It's like camping for sick and injured people! On second thought, maybe the UK is just the best at partying.